High Impact Practice:Support distribution of a wide range of contraceptive methods and promotion of healthy family planning behaviors through social marketing. Social marketing in family planning programs makes contraceptive products accessible and affordable through private-sector outlets, such as pharmacies and shops, while using commercial marketing techniques to achieve specific behavioral goals. Social marketers combine product, price, place (distribution), and promotion—often referred to as the “4Ps” or the “marketing mix”—to maximize use of specific health products among targeted population groups. 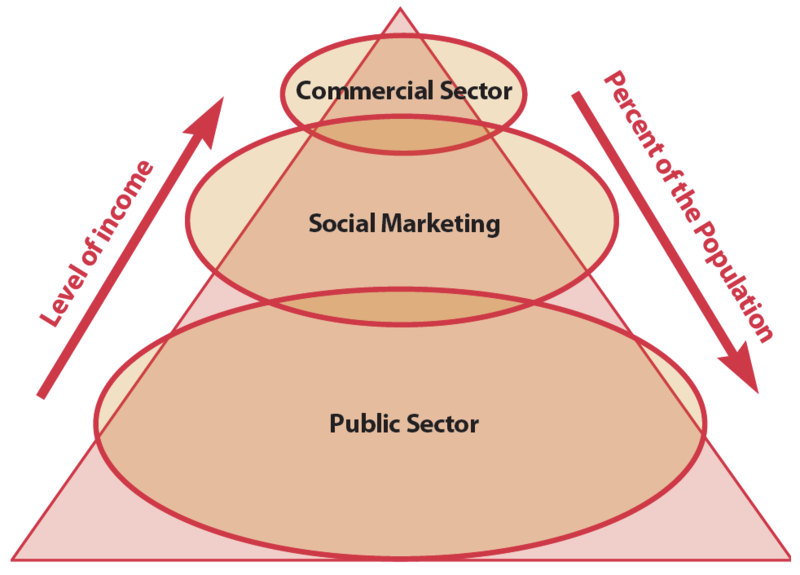 There is a wide range of social marketing models to draw on; the choice of model depends on program goals, the country context, the level of investment, and time frame.1 As Figure 1 illustrates, social marketing is designed to fill the “gap in the middle,” reaching those not served with free programs from the public sector or with high-priced commercial products targeted to the wealthiest segments. In reality, social marketing programs can be designed to also reach the poor, if product prices are subsidized sufficiently. Conversely, when subsidized social marketing programs are ineffectively targeted, they can crowd out commercial brands. 1 The discussion of social marketing models draws heavily from “Social Marketing Models for Product-Based Reproductive Health Programs” (Armand, 2003). Social marketing interventions can help achieve: (1) increased availability of family planning products, (2) increased range of available products at a variety of prices resulting in increased client choice, (3) reduced burden on the public sector by shifting clients who can pay to the private sector, (4) increased family planning program sustainability, (5) better targeting of donor funding, and (6) increased family planning use in general and among underserved populations. Social marketing is one of several “high-impact practices in family planning” (HIPs) identified by a technical advisory group of international experts. When scaled up and institutionalized, HIPs will maximize investments in a comprehensive family planning strategy (USAID, 2011). For more information about HIPs, see http://www.fphighimpactpractices.org/overview. Social marketing can promote a wide range of methods, including oral contraceptives, condoms, emergency contraception (EC), injectables, and Cyclebeads® for the Standard Days Method. There is strong evidence to show the impact of social marketing programs on the availability of condoms, oral contraceptives, and Cyclebeads. In Pakistan, the social marketing program supports 70% of the market share for condoms (Rahman, 2007). Studies in Benin, the Democratic Republic of Congo, and Ecuador found that social marketing campaigns increased awareness and sales of CycleBeads for the Standard Days Method (IRH, 2008). In Bangladesh, the social marketing program has been highly successful at social marketing of injectables (RCS, 2003; RCS, 2006; Eminence, 2010). Social marketing of EC, implants, and IUDs is less common and research on the impacts of these programs is still limited. Social Marketing has been used to improve access to and use of a variety of family planning and other health products. Social marketing programs improve access by tapping into large networks of private providers. Social marketing complements the public-sector family planning distribution system by utilizing the extensive network of commercial and non-governmental sector outlets, such as pharmacies, shops, community-based distributors, private health care providers/outlets, kiosks, and community health workers. Together, the public and private distribution systems provide more extensive access and population coverage than the public sector could provide alone. Social marketing helps reduce geographic and socio-economic disparities in family planning use. Analysis of Demographic and Health Survey (DHS) data shows that women who are young, poor, less educated, and who live in rural areas have more difficulty meeting their family planning needs than their counterparts. These inequities exist in all regions except Central Asia, and the gaps are larger and more common in sub-Saharan Africa. In addition, many countries in sub-Saharan Africa demonstrate little or no progress toward reducing the equity gap (Ortayli and Malarcher, 2010). Social marketing programs can be targeted to these underserved groups. Analyses of DHS data have shown that even among the poorest people in the poorest countries, significant numbers of women obtain their contraceptive method from a private-sector source (PSP-One, 2005). Much of this access through private- sector outlets has been made possible by social marketing programs. Social marketing helps reach underserved young people. Adolescents generally prefer to obtain contraceptive methods from private-sector sources, which tend to provide more anonymity than public-sector sources (Meekers et al., 2001). Through subsidization, social marketing reduces the true market cost of these services to improve accessibility for the young and poor. 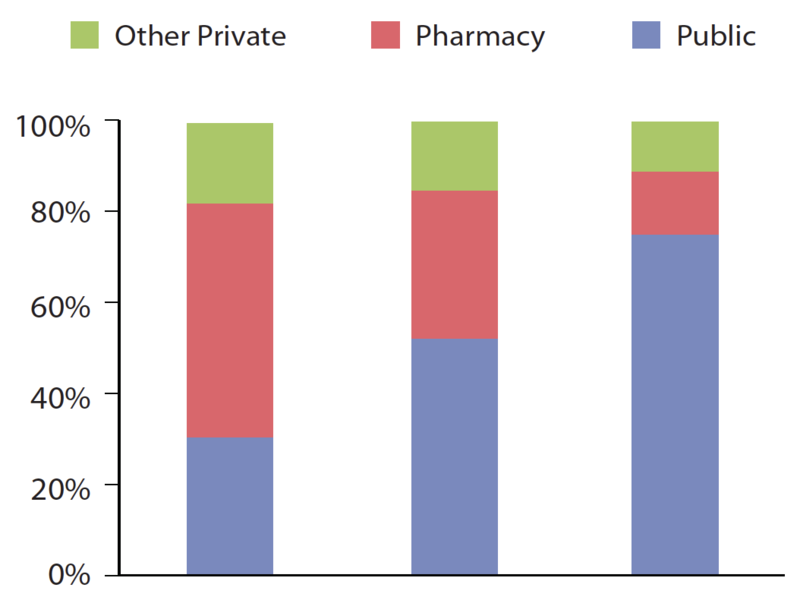 For example, in Bangladesh, the majority of young married women use socially marketed contraceptives sold by a local NGO and obtained through pharmacy outlets (Karim et al., 2007) (see Figure 2). Social marketing programs increase contraceptive use. At least three systematic reviews of social marketing programs found that these programs have had a positive impact on clients’ knowledge of and access to contraceptive methods and on condom use (Chapman, 2003; Madhavan, 2010; Sweat et al., 2012). The reviews note that the programs demonstrate the largest increases for condom use and that the extent of knowledge and behavioral change varied between country programs. A 2012 meta- analysis concluded that the “cumulative effect of condom social marketing over multiple years could be substantial” (Sweat et al., 2012). A recent DFID review concluded, “Engagement with the private sector via social marketing and franchising can increase access to contraceptives to women who need them. Although, it is less clear whether they can reach the very poorest” (Mulligan, 2010). In urban North India, a three-year social marketing campaign for condoms reversed a steady decline in total condom sales, increasing sales by 21% (from 201 million pieces sold to 243 million). Moreover, pre-post surveys showed that nearly 70% of men with high exposure to the campaign reported current condom use with their spouse compared with only 50% of men who were not exposed (PSP-One, 2008). Figure 3 shows the increasing contribution that social marketing is making globally. In the past 10 years, social marketing programs have doubled the number of couple-years of protection that they support. Social marketing programs reach youth effectively. A four-country study assessed results of contraceptive social marketing programs that relied on mass media, peer education, and youth-friendly services to increase contraceptive use among male and female adolescents (Agha, 2002). Results showed that interventions targeted at adolescents can be effective in changing attitudes and sexual behavior if they include multiple channels of communication, reach a substantial proportion of young adults, and make contraceptives widely available. In particular, in Cameroon, where the implementation was over a longer duration and was more intense than in other countries, the intervention proved effective in changing contraceptive use behavior among young men and women. Fund” so that promotional activities could be sustained after the graduation of USAID support. Results from the DHS show that after the social marketing program started, there was a substantial increase in the proportion of women in the three poorest wealth quintiles using oral contraceptives (Agha et al., 2005), so much so that the gap between rich and poor in oral contraceptive use was reduced to a few percentage points post-graduation in 2003. Moreover, increases in contraceptive use were sustained after USAID graduated its promotional support (Agha and Do, 2008). 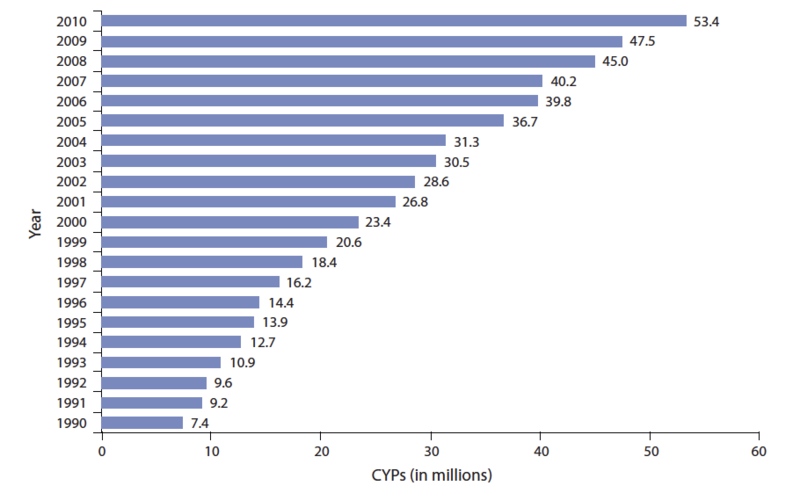 CYPs are totaled from social marketing program sales in an increasing number of countries every year, ranging from 32 countries in 1991 to 69 countries in 2010. Social marketing is an appropriate approach to introduce or promote when: (1) unmet need for contraceptive supply methods is moderate to high; (2) sustained behavior change communication is needed; (3) availability of private-sector outlets would greatly enhance access; (4) clients have moderate intention and ability to pay for family planning products and services; and (5) branding can significantly increase the acceptance of a product or an idea. There are three main social marketing models: the NGO model, the manufacturer’s model, and hybrid models. The type of model to use depends on health impact and sustainability goals (see box below). The NGO model is more likely to focus on achieving health impact and serving the poor because it does not need to secure a financial return and does not need to be concerned with program sustainability in the short run. Social marketing programs managed by NGOs have greater control over the full marketing mix as brands are often created and managed in-house rather than by a commercial manufacturer. In Myanmar condoms were virtually invisible when PSI launched its Aphaw brand of condoms, which means “trusted companion.” PSI developed a culturally sensitive brand name and packaging, subsidized the price to make it affordable, and invested in a large-scale behavior change campaign to promote the brand and overcome resistance and taboos against condoms. The project also identified a range of population groups that practice high-risk behaviors and developed a targeted campaign to reach them (UNAIDS, 2000). The manufacturer’s model is a partnership between product manufacturers or suppliers that control the product and brand and the donor that supports demand-creation efforts to grow the overall market. In addition, these programs generally support the expansion of commercial distribution systems to expand the reach of commercial brands into more distant areas. Programs using the manufacturer’s model often negotiate the introduction of lower-priced commercial brands, or price reductions for existing brands, in exchange for market-building support. The Goli ke Hamjoli (Friends of the Pill) social marketing campaign in India did not promote a specific brand but aimed instead to increase oral contraceptive sales overall. Through a partnership with oral contraceptive manufacturers, the program used a combination of advertising, public rations, and provider detailing to reduce misconceptions about oral contraceptives (Meekers et al., 2004). Hybrid models blend aspects of the NGO model and the manufacturer’s model in order to better meet both sustainability and family planning access objectives. These hybrid models include, for example, NGO-based programs with high cost-recovery or cross-subsidy activities and partnerships between nonprofit and for-profit organizations. Some NGOs also implement direct partnerships with contraceptive product manufacturers to market and distribute their products on a sustainable basis. Other examples of the hybrid model include fully commercial products, sustainable products, sustainable programs, or some combination of all three models. Match the social marketing model to program objectives and country context. The most appropriate social marketing model—NGO model, manufacturer’s model, or a hybrid—depends on the program’s objectives and country context, including the level of economic development, policy environment, commercial sector infrastructure, ability and willingness of clients to pay, level of family planning use, and unmet need. Ensure coordination among key players for effective market segmentation. Coordination with other donors and the public sector will ensure that free and heavily subsidized social marketing products are targeted to those who need them the most. This will help to avoid crowding out low-priced commercially viable family planning products from the market that are serving those who can afford to pay. Conduct research to ensure appropriate social marketing program design and implementation. Research helps a social marketing program gain insight into and segment the target audience. In addition, continuous monitoring and evaluation with iterative adjustments to program design and implementation will help ensure greatest impact. Use the power of social marketing to introduce and scale up access to and use of new contraceptive products and brands. Social marketing offers programs the ability to quickly increase consumer knowledge of new products and brands and scale up distribution. Once a social marketing program has been established, additional products can be added, building on the existing platform and leveraging resources. Plan for sustainability at the beginning. Multi-year funding is needed to build a sustainable market for contraceptive products. Short-term donor funds can result in subsidized products being pulled from the market or significant price increases. Take advantage of prior and ongoing successful campaigns. Start with target markets that are most ready for action. Promote single, doable behaviors—one at a time. Have a little fun with messages that promote positive social behavior and gender dynamics. Use media channels at the point of decision making. Agha S. A quasi-experimental study to assess the impact of four adolescent sexual health interventions in sub-Saharan Africa. Int Fam Plan Perspect 2002;28(2):67-70, 113-118. Available from: https://www.guttmacher.org/sites/default/files/pdfs/pubs/journals/2806702.pdf. Agha S, Do M, Armand F. When donor support ends: the fate of social marketing products and the markets they help create. Soc Mar Q 2005;12(2):28-42. Agha S, Do M. Does an expansion in private sector contraceptive supply increase inequality in modern contraceptive use? Health Policy Plan 2008;23(6):465-475. Armand F. Social marketing models for product-based reproductive health programs: a comparative analysis. Washington, DC: USAID/Commercial Market Strategies Project; 2003. Available from: http://pdf.usaid.gov/pdf_docs/PNACT358.pdf. Barnes J, O’Hanlon B, Feeley F, McKeon K, Gitonga N, Decker C. Kenya private health sector assessment. Bethesda, MD: Abt Associates/Private Sector Partnerships-One Project; 2009. Chapman S, Astatke H. Review of DFID approach to social marketing. Annex 5: Effectiveness, efficiency and equity of social marketing, Appendix to Annex 5: The social marketing evidence base. London: DFID Health Systems Resource Centre; 2003. Available from: http://hdrc.dfid.gov.uk/wp-content/uploads/2012/10/Review-of-DFID-approach-to-Social-Marketing-Annex5.pdf. DKT International. 1991 – 2010 Contraceptive social marketing statistics. Washington, DC: DKT International; 2011. Available from: http://www.dktinternational.org/publications-resources/contraceptive-social-marketing-statistics/. Eminence. Evaluation of Blue Star Program. Report prepared for Social Marketing Company. Dhaka, Bangladesh: Eminence; 2010. Institute for Reproductive Health (IRH), Georgetown University. Social Marketing final report: three country overview. Washington, DC: IRH; 2008. Available from: http://pdf.usaid.gov/pdf_docs/PNADL891.pdf. Karim A, Sarley D, Hudgins AA. Bangladesh: Family planning market segmentation—update of the 2003 analysis. Arlington, VA: USAID | DELIVER PROJECT; 2007. Kotler, P, Lee N. Social marketing: influencing behaviors for good. Sage Publications; 2008. Madhavan S, Bishai D. Private sector engagement in sexual and reproductive health and maternal and neonatal health: a review of the evidence. London: DFID Human Development Resource Centre, 2010. Available from: https://www.gov.uk/government/uploads/system/uploads/attachment_data/file/330940/Private-Sector-Engagement-in-SRH-MNH.pdf. Meekers D, Ahmed G, Molatlhegi MT. Understanding constraints to adolescent condom procurement: the case of urban Botswana. AIDS Care 2001;13(3):297-302. Meekers D, Van Rossem R, Zellner S, Berg R. Using behavior change communications to overcome social marketing sales plateaus: case studies in Nigeria and India. Washington, DC: USAID/Commercial Market Strategies Project; 2004. Available from: https://www.shopsplusproject.org/sites/default/files/resources/910_file_07_Nigeria_and_India_Behavior_Change_Communications.pdf. Mulligan J, Nahmias P, Chapman K, Patterson A, Burns M, Harvey M, et al. Improving reproductive, maternal and newborn health: Reducing unintended pregnancies. Evidence Overview. London: DFID; 2010. Available from: https://assets.publishing.service.gov.uk/media/57a08b1e40f0b652dd000ae4/RMNH-Evidence-Overview-Reducing-Unintended-Pregnancies.pdf. Ortayli N, Malarcher S. Equity analysis: identifying who benefits from family planning programs. Stud Fam Plann 2010 Jun;41(2):101-8. Private Sector Partnerships-One Project (PSP-One). State of the private health sector wall chart. Washington, DC: USAID/PSP-One; 2005. Available from: https://www.shopsplusproject.org/sites/default/files/resources/2676_file_wallchart_final.pdf. Private Sector Partnerships-One Project (PSP-One).“Yahi Hai Sahi!” Growing the condom market in North India through the private sector. Washington, DC: USAID/PSP-One; 2008. Available from: https://www.shopsplusproject.org/sites/default/files/resources/4770_file_Yahi_Hai_Sahi.pdf. Rahman A. Mid-term assessment of Social Marketing Program (2003 – 2008). Islamabad, Pakistan: Grant Thornton for the U.S. Agency for International Development; 2009. Available from: http://pdf.usaid.gov/pdf_docs/PDACL174.pdf. Research and Computing Services Private Limited (RCS). Evaluation of Blue Star Injectable Program. Report prepared for Social Marketing Company. Dhaka, Bangladesh: RCS; 2003. Research and Computing Services Private Limited (RCS). Evaluation of Blue Star Program. Report prepared for Social Marketing Company. Dhaka, Bangladesh: RCS; 2006. UNAIDS. Social marketing: expanding access to essential products and services to prevent HIV/AIDS and to limit the impact of the epidemic. Geneva: UNAIDS; 2000. Available from: http://files.unaids.org/en/media/unaids/contentassets/dataimport/publications/irc-pub04/social_marketing_en.pdf. U.S. Agency for International Development (USAID). High impact practices in family planning. Washington, DC: USAID; 2011 Apr 22. 2 p. Available from: https://www.fphighimpactpractices.org/high-impact-practices-in-family-planning-list. This document was drafted by Ruth Berg and Susan Mitchell. Critical review and helpful comments were provided by Ian Askew, Vicki Baird, Hashina Begum, Regina Benevides, Steve Chapman, Peggy D’Adamo, Selamawit Desta, Marguerite Farrell, Fariyal Fikree, Karen Foreit, Jewel Gausman, Karen Hardee, Victoria Jennings, Shawn Malarcher, Nithya Mani, Elaine Menotti, Stembile Mugore, Jennifer Pope, Heidi Quinn, Ilka Rondinelli, Marcella Rueda, Ruwaida Salem, Shelley Snyder, Jeff Spieler, and John Stanback. This HIP brief is endorsed by: Abt Associates, EngenderHealth, FHI 360, Futures Group, Georgetown University/ Institute for Reproductive Health, the International Planned Parenthood Federation, IntraHealth International, Jhpiego, John Snow, Inc., Johns Hopkins Bloomberg School of Public Health Center for Communication Programs, Marie Stopes International, Pathfinder International, Population Council, Population Services International, the United Nations Population Fund, the U.S. Agency for International Development, and Venture Strategies Innovations. The World Health Organization/Department of Reproductive Health and Research has contributed to the development of the technical content of these documents which are viewed as a summary of evidence and field experience. It is intended that these briefs are used in conjunction with WHO Family Planning Tools and Guidelines: http://www.who. int/topics/family_planning/en/.